Chiefly found associated with woodland and paperbark swamps feeding on various grasses such as Themeda and Megathrysus. Mature larvae 39 mm long, body fawn to dark orange-brown with brownish lines along the side, tail segment with a projection; head reddish-brown with 2 large dorsal horns. Adults on upper surface reddish-brown but grey towards the edges, enclosed are 2 conspicuous eyespots and often several smaller ones; hind has 4-5 eyespots subterminally. 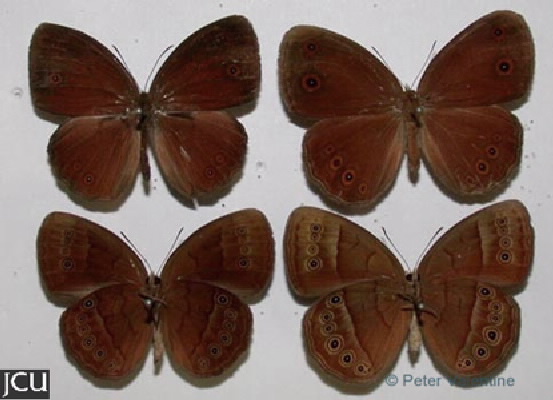 Lower surface reddish-brown with darker brown near margins, fore wing with 4-6 eyespots, hind wing with 6-7 eyespots.